The weather forecast last night was for heavy clouds and possibly rain, but we woke up to good news: the sky was clear. However, there was a south wind, and this was the worst day for it. Most of today’s route was going down the very flat Rhone valley until the turn off to Mont Ventoux, the first checkpoint of the Transcontinental Race (for more on the TCR, check the previous post). 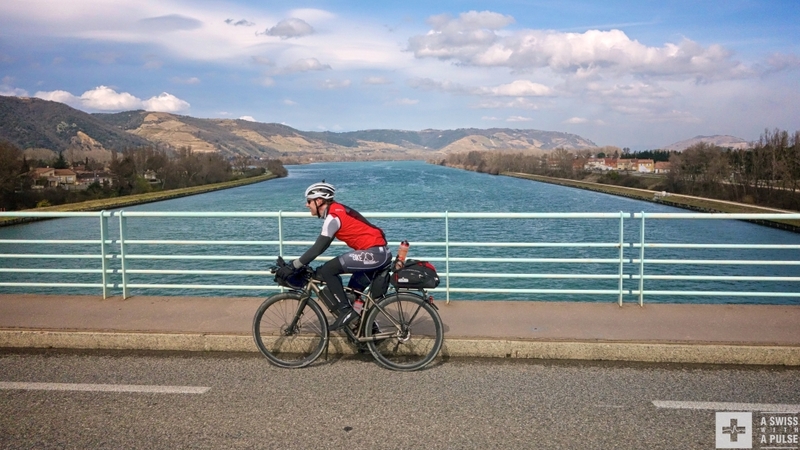 Happy to stay dry, but less happy to battle the wind, we left our hotel in Valence at 8.15am to start our very own Trofeo Baracchi – adventure cycling style. The Trofeo Baracchi was a time trial for teams of two organized in Italy. Until it disappeared in 1990 (there was one more edition in 1991 but it was an individual time trial), the race crowned many campionissimi such as Fausto Coppi, Ercole Baldini, Jacques Anquetil, Eddy Merckx, Felice Gimondi, Francesco Moser and Bernard Hinault. Unfortunately, we are more grimpeurs than rouleurs so we knew we were in for a long, slow day. We were taking turns to try and maintain a good speed, but we were not racing. So we stopped after 60km at a bakery in Tain L’Hermitage, had a pain au chocolat and bought lunch. 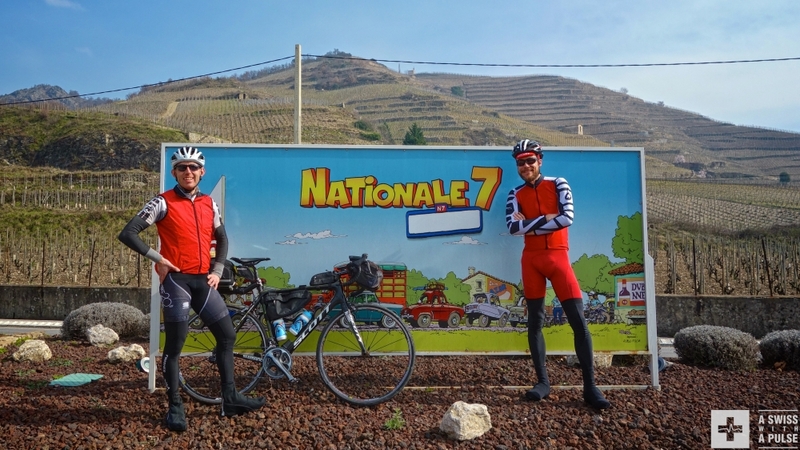 There we met a nice man walking his dog who took a picture of us in front of a Nationale 7 sign. Known as the Route des Vacances, it used to be the symbol of holidays for French people before the autoroute made it old fashioned. 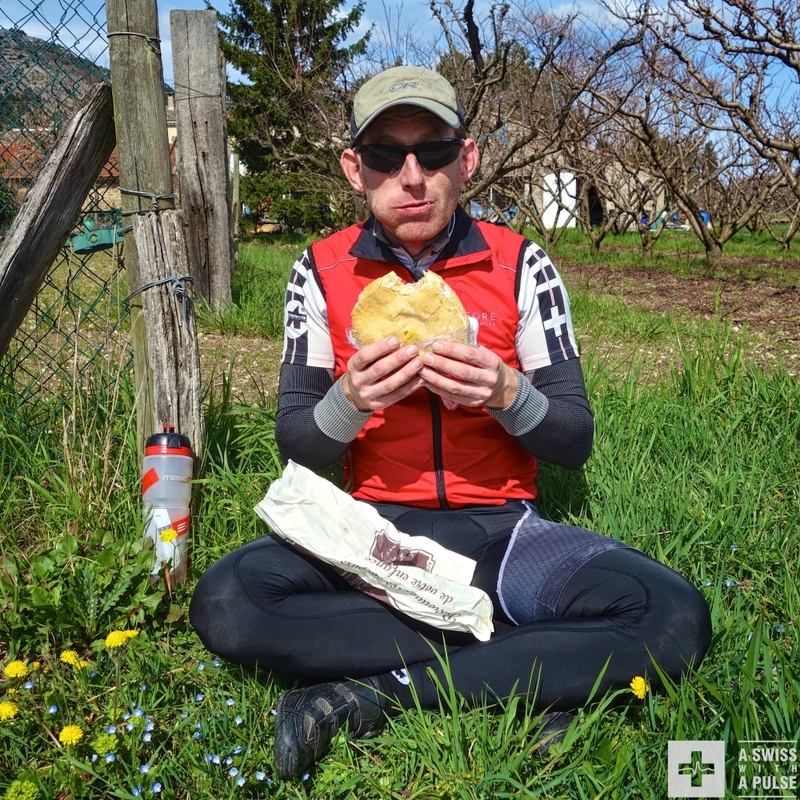 Then there was more headwind and we stopped on the road side at km 87 to eat our lunch, the very French pan bagnat. 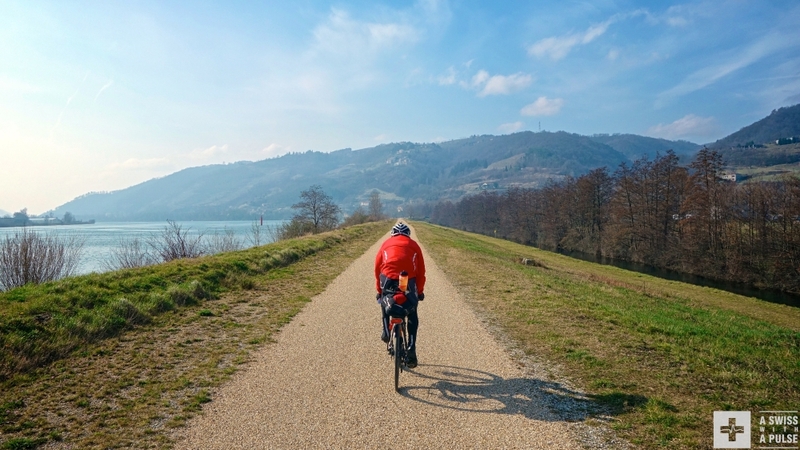 Fortunately, Chris had picked a mix of bike paths, small roads and some bigger routes for the day, which brought a welcome variety to our windy misery. It will also be a good itinerary for the TCR, where riders tend to go for the most obvious, direct roads. In essence, these are also the boring, crowded ones. Our route will be almost as fast, and much more enjoyable. It all came to an end after 122 km when we left the Rhone valley to head east towards Mont Ventoux. We hit some hills and found our first lavender fields. I parted ways with Chris at km 172 in Suze la Rousse, the best town name ever. 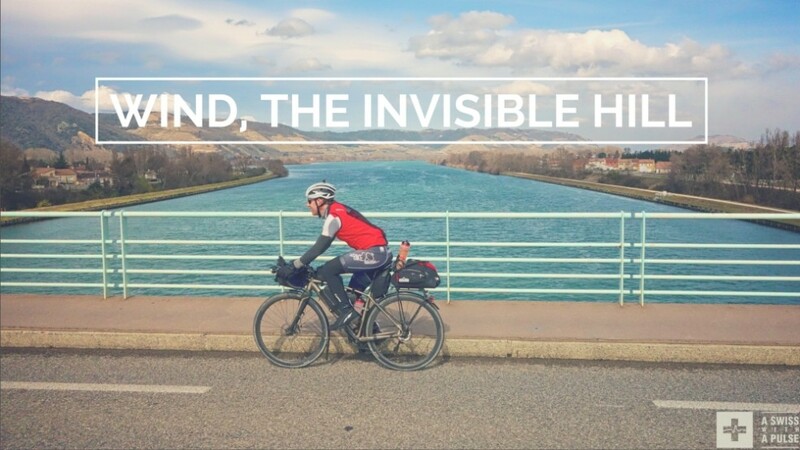 He was riding back to the Rhone valley to catch a train home that night, while my plan was to ride to Aix-en-Provence the next day to visit my daughter Wendy. In the last hour, I got some rain but nothing that could detract me from the exaltation of riding my second 200km day in a row, a first for me. 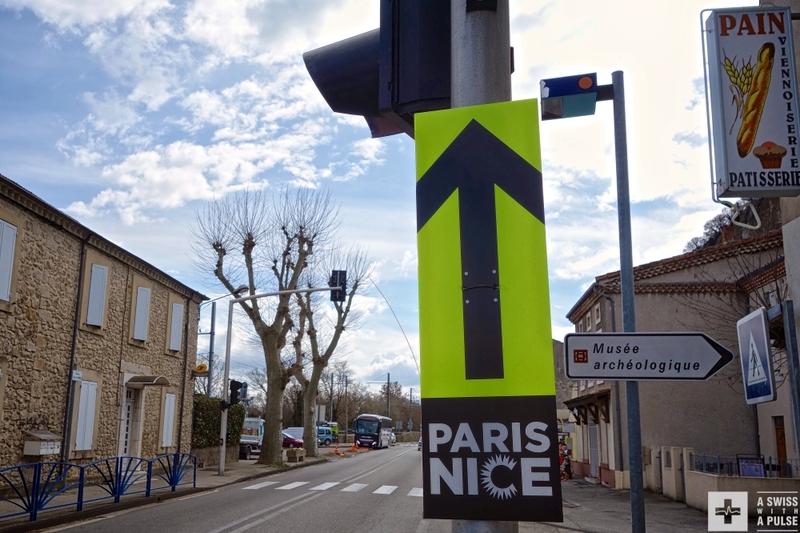 In fact, I was feeling so good that I forgot to eat and badly bonked 2km from Carpentras, my goal for the day. Have you ever looked for a hotel in a hypoglycemic state? Somehow I managed to check in. Then I ate all the food I could find in my bags, had a shower, washed my shorts in the sink, went out for a huge dinner and an equally huge beer, and finally crashed into bed. I could get used to this life.